The first edition of 21st-century design fair Collectible is taking place this week in Brussels. Dezeen's Natashah Hitti reveals her pick of the best works on show, from tables made of inflated brass cushions to brick-wall punching bags. Exclusively dedicated to contemporary design, the new fair is the first of its kind, according to creators Liv Vaisberg and Clélie Debehault. The duo wanted Collectible to differ from other shows that, according to the pair, often categorise and put each individual in a box. The exhibit aims to encourage "the freedom of hybrid choices," showcasing objects that are not made for shops or the mass market. Co-founders Vaisberg and Debehault drew on their backgrounds in art direction and curation when deciding on the show's format, which is more similar to that of an art museum than a design fair. "We curated it so that there wasn't just an alley and then an alignment of booths. We wanted to take the rules of the conventional fair and turn them upside down," Vaisberg told Dezeen. "We wanted to challenge visitors by changing the typical configuration, creating a layout that forces people to cross everything – like in IKEA showrooms, for instance: even though you don't want a kitchen, you will have to go visit and look at the kitchens," she added. Unique and limited edition contemporary pieces are being exhibited inside the industrial Vanderborght building, located in the centre of Brussels. 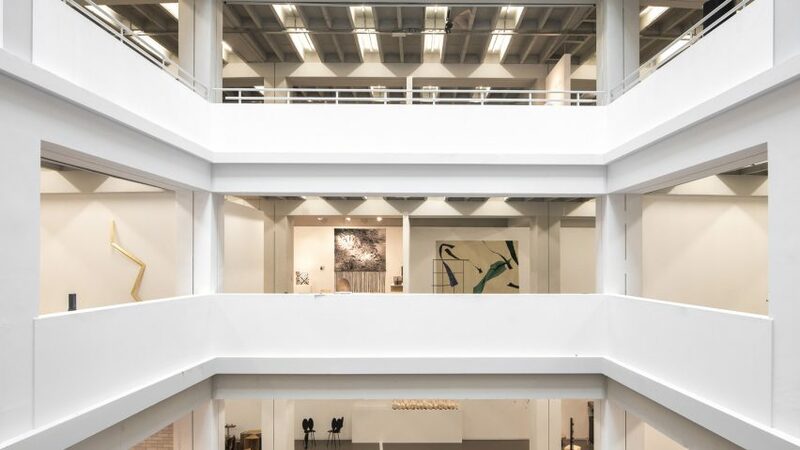 Each exhibitors' pieces are dotted around each of the building's five stories, taking visitors on a fluid journey around the space, and encouraging them to interact with all works. "We don't want visitors to take the map and choose where they want to go and what they want to see, and ignore the rest. Often at fairs, things have to be particularly eye-catching to make people stop and look, but here at Collectible we can have delicate things, details, because everyone is going through all booths," Vaisberg said. Dutch designers Mieke Meijer and Roy Letterlé based this collection of cubic, tubular lights – called Space Frames – on archetypal architectural elements such as arcs, columns, trusses and plates. Each lightweight plywood structure is filled with tubes of LED lights and covered in a polyester fabric. According to the studio, each light is "an experimental research into physical and visual lightness, balance and stability." A 200-kilogram slab of marble sat atop of an air-filled brass cushion make up these coffee tables by Belgian designer Ben Storms. The designer wanted to emphasise the contrast between materials and masses in the collection and used inflated volumes of air encased in metal, which he likens to "soft skins", to support large bulks of rock. Rotterdam-based designer Sabine Marcelis explored the relationship between light and colour in her Dawn lights, which were inspired by the colours of the sky at the time just before sunrise. The main surface of her light sculpture, which was exhibited by Victor Hunt Gallery at Collective, is formed of cast polyester resin that has been coloured in a gradient of reds and oranges. These colours vary in hue depending on their distance from the circular neon light embedded on its underside – similar to a sunrise. Comme des Garçons founder Rei Kawakubo exhibited this chair last year at Galerie A1043 in Paris, alongside another 14 pieces of tables, chairs and stools designed for the brand's stores. Initially designed as an extension of the shop fixtures, the futuristic steel chair is now being displayed by Maniera Gallery in the Vanderborght building for Collectible. Each of these "perfectly imperfect" ceramic tableware pieces by Delphine Bekaert is unique. Comprised of minimal bowls, plates, cups and spoons, the collection features three simple colours of white, pale pink or yellow, and is designed to be "used frequently and built to last." The collection is being exhibited inside a deli counter at Collectible as a reflection of their handmade nature. Core Studio curated an exhibition at Collectible, called Hyper Ordinary, from objects built using industrial materials that are normally perceived as commonplace or merely functional, like reinforced glass or concrete. Design Academy Eindhoven graduate Lucas Muñoz used materials that belong behind and in between our walls to make his Tubular chair for the display, which is constructed using galvanised steel pipes, with a seat made from a sheet of copper. This collection of wooden tables by Netherlands designer Louis Bos was inspired by the handmade patterns found on the facades of Kasséna homes found south of Burkina Faso in West Africa. Bos translated these patterns into contemporary designs, mixing the traditional design with western styles – specifically Dutch and Scandinavian. The table surfaces have been cut to create rows of pyramidal shapes. 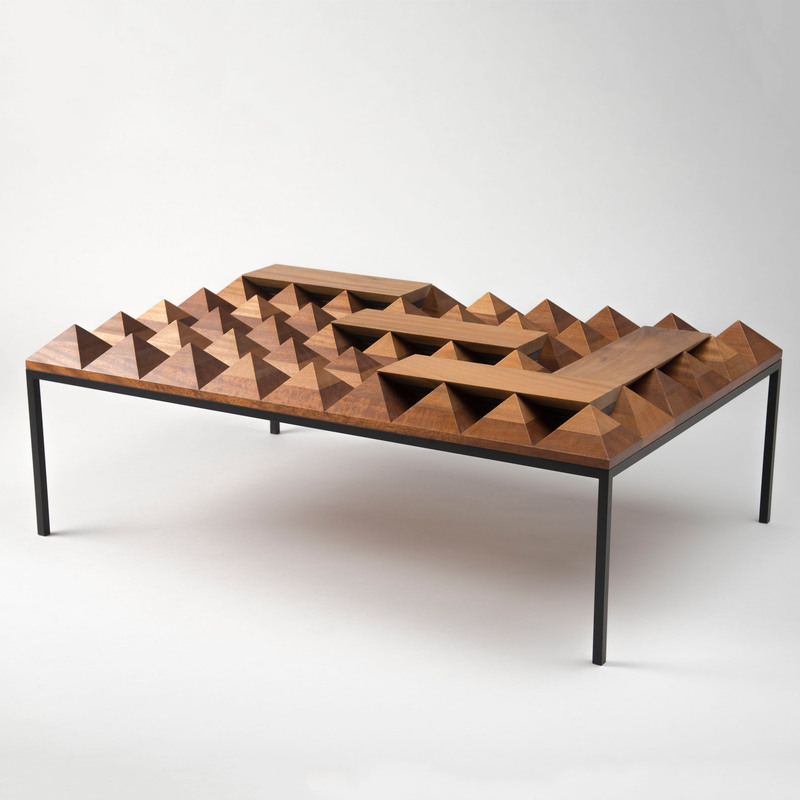 Accompanying each table are several moveable elements made from blocks of wood, which slot in between the pyramids to be used as resting surfaces. Design duo Job Smeets and Nynke Tynagel from Studio Job offered a series of cartoon-like objects for Collectible, exhibited by Gufram's spin-off company, SuperGufram. 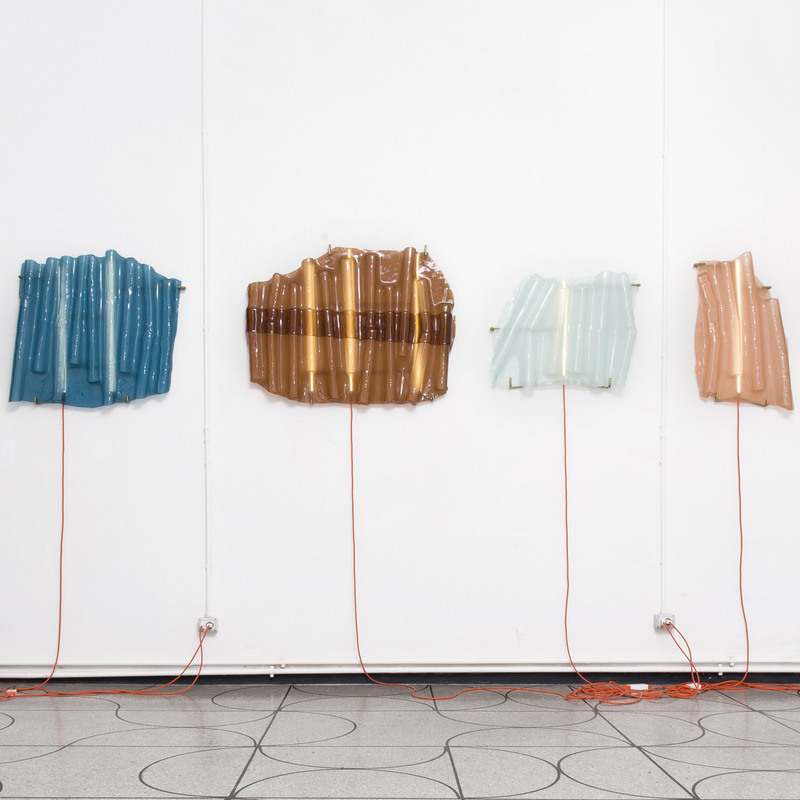 A punching bag patterned with bricks was among the collection, which also included a giant plastic cactus and a room divider that has been textured and coloured to look like a wooden fence. Milan-based designer Paolo Gonzato took inspiration from corrugated iron roofs and industrial irons when designing this collection of sculptural glass lights for Collectible. Displayed by Camp Design Gallery, the Baracche collection – meaning "shacks" in Italian – was created using float glass, tropicalised iron and LED lights. Belgian designer Maarten De Ceulaer was inspired by his passion for travelling for this collection of drawers, which have been constructed using leather suitcases and briefcases stacked on top of one another. Coloured in pastel tones of mint green and light blue, the suitcases represent the "modern nomads" who travel through cities and continents without restrictions or boundaries, says the designer.